Franz Waxman (/ˈwæksmən/; 24 December 1906 – 24 February 1967) – born Franz Wachsmann – was a German and American composer of Jewish descent, known primarily for his work in the film music genre. His film scores include Bride of Frankenstein, Rebecca, Sunset Boulevard, A Place in the Sun, Stalag 17, Rear Window, Peyton Place, The Nun's Story, and Taras Bulba. He received twelve Academy Award nominations, and won two Oscars in consecutive years (for Sunset Boulevard and A Place in the Sun). He also received a Golden Globe Award for the former film. Bernard Herrmann said that the score for Taras Bulba was the most wonderful thing. Waxman was born Franz Wachsmann (German: [ˈvaksman]) in Königshütte (Chorzów) to Jewish parents in the German Empire's Prussian Province of Silesia (now in Poland). At the age of three Waxman suffered a serious eye injury involving boiling water tipped from a stove, which left his vision permanently impaired. In 1923, at age 16, Waxman enrolled in the Dresden Music Academy and studied composition and conducting. Waxman lived from the money he made playing popular music and managed to put himself through school. While working as a pianist with the Weintraub Syncopators, a dance band, Waxman met Frederick Hollander, who eventually introduced Waxman to the eminent conductor Bruno Walter. Waxman worked as an orchestrator for the German film industry, including on Hollander’s score for The Blue Angel (1930). Waxman’s first dramatic score was for the film Liliom (1934). That year Waxman suffered a severe beating by Nazi sympathizers in Berlin that led him to leave Germany and move with his wife first to Paris, and soon after to Hollywood. In Hollywood, Waxman met James Whale, who had been highly impressed by Waxman's score for Liliom. 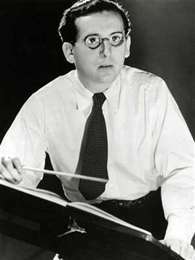 The success of his score for Whale's Bride of Frankenstein (1935) led to the young composer’s appointment as Head of Music at Universal Studios. Waxman, however, was more interested in composition than musical direction for film, and in 1936 he left Universal to become a composer at MGM. Waxman scored a number of pictures during the next few years, but the score for Alfred Hitchcock's Rebecca (1940) made his name. Waxman was frequently called to work on scores of horror or suspense films, and Rebecca was the culmination of the genre for Waxman. In 1943 Waxman left MGM and moved to Warner Bros., where he worked alongside such great film composers as Max Steiner and Erich Wolfgang Korngold. A period of extended composition followed, including such films as Mr. Skeffington (1944) and Objective, Burma! (1945). A climactic scene in Objective, Burma! was scored fugally, and this would become one of Waxman's trademarks, returning in The Spirit of St. Louis (1957) and Taras Bulba (1962). In 1947 Waxman formed the Los Angeles Music Festival, for which he served as music director and conductor for the rest of his life. Waxman's goal with the LA Music Festival was to bring the thriving town to “European cultural standards”, according to Tony Thomas. In addition to performing the work of great masters such as Stravinsky, he also collaborated with his colleagues, such as Miklós Rózsa, conducting his Violin Concerto. His work on Sunset Boulevard (1950) led to an Academy Award. The score is fast paced and powerful, utilizing various techniques to highlight the insanity of Norma Desmond, including low pulsing notes (first heard in The Bride of Frankenstein) and frequent trills. According to Mervyn Cooke, Richard Strauss’s opera Salome was the inspiration for the wild trills heard during Desmond’s insane final performance. Waxman received a second consecutive Oscar for A Place in the Sun (1951). However, while awards for film music highlighted the beginning of the 1950s, the decade is also the decade during which Waxman began to write serious works for the concert hall. The Sinfonietta for Strings and Timpani came in 1955 and 1959 saw the completion of Waxman's oratorio Joshua. Composed to commemorate the death of Waxman's wife, Joshua with its strong Hebrew influences and extensive use of form is a powerful example of Waxman’s compositional powers by the end of the 1950s. Waxman’s later life continued to see extreme growth as a composer. Christopher Palmer writes that at the time of his death in 1967, “Waxman was at the zenith of his powers.” Waxman’s output in the 1960s was perhaps more subdued than that which came before it, however he did write Taras Bulba in 1962. Waxman worked on several television shows, including Gunsmoke, in 1966. "The Song of Terezin" (1965) was based upon poetry by children trapped in the Nazi's Theresienstadt concentration camp. Perhaps Waxman’s deep spiritual connection to the subject came from his own encounters with Nazism on a Berlin street in 1934, but whatever the reason for Waxman’s deep commitment to the subject, "The Song of Terezin" stands as the exemplary work of the composer’s life.The work is composed for mixed chorus, children’s chorus, soprano soloist, and orchestra. Waxman’s career ended with his death from cancer in February 1967, two months after his sixtieth birthday. He leaves a legacy of over 150 film scores and an abundant collection of concert works. Some of Waxman's music has been featured on commercial recordings, both on LP and CD. Charles Gerhardt and the National Philharmonic Orchestra played highlights from various Waxman scores for an RCA Victor recording in the early 1970s that utilized Dolby surround sound. The music for Taras Bulba has been recorded by the City of Prague Philharmonic. ↑ Palmer, Christopher. "Franz Waxman", Chapter 4 in The Composer in Hollywood. New York, NY: Marion Boyars, 1990, 96. ↑ Thomas, Tony. “Franz Waxman.” Chap. 4 in Film Score: The Art & Craft of Movie Music. Burbank, CA: Riverwood Press, 1991, 35. ↑ Sullivan, Jack. Hitchcock's Music Chapter 5, “Rebecca: Music to Raise the Dead.” New Haven, CT: Yale University Press, 2006, 60.